Can you believe it’s August already? Where has this summer gone? 2018 has been a busy year for Busch Gardens. New pass program, Food and Wine Fest, Concerts, Summer Nights, and the upcoming Beir Fest. What was your favorite food or drink this year at the Food and Wine Festival? I absolutely fell in love with the Brazilian booth. The Churrasco was delicious and perfectly cooked, the grilled pineapple was a hit, but my absolute favorite this year was the Brazilian lemonade!! I couldn’t get enough of that drink and kept going back for more every chance I got. While I’m still bummed they removed the Canada booth, Brazil was the perfect addition to replace them and quickly became my new favorite booth. Not long after the Food and Wine Fest ended in July, the park introduced their Summer Nights event. Music, lasers, pyrotechnics, fireworks, and let’s not forget the dance troupe, Light Balance. If you haven’t been to the park to check out their Summer Nights yet YOU NEED TO GO!! Replacing the pirates show at the Royal Palace Theatre this year is SPARK, a live rave/ dance party featuring lasers, pyrotechnics, music, and bubbles. This show is running nightly through August 12. The Wilkommenhaus features projection light mapping (think lasers projected onto the building). The sun goes down, the building lights up! This is a fun show that I would love to see return next year. If you’ve been through the park during the day, you’ve probably noticed the park left the Cuba Kiosk up from the Food and Wine Festival. This kiosk is open and offering fun treats such as fried Twinkies and Acai berry bowls (think frozen yogurt with toppings, yum!) and mixed drinks. 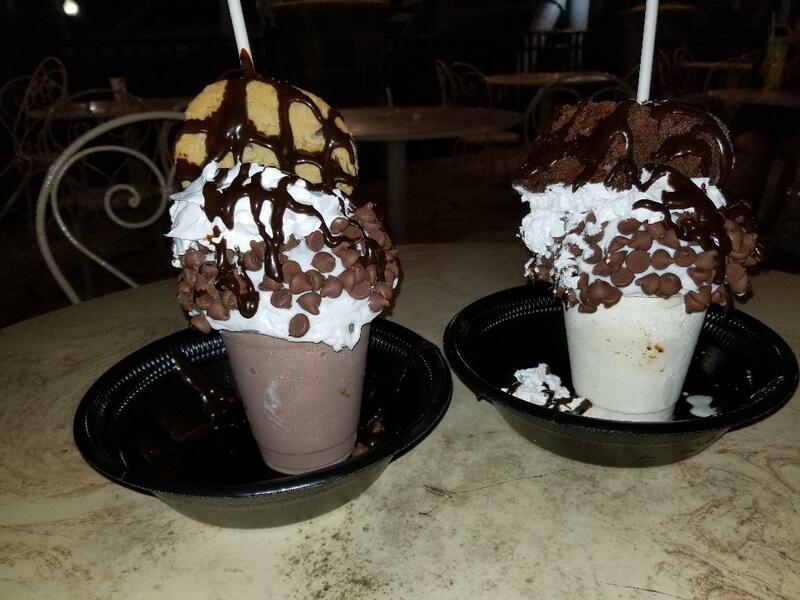 Just a few feet away from the Summer Nights Kiosk at Josephines Creamery the park is featuring their all new Freak Shakes, available only during Summer Nights. What is a Freak Shake? It’s an insane monstrosity containing a cold and creamy milkshake buried under a mound of marshmallow fluff, chocolate chips, cookie dough, whipped cream, and a cookie or brownie (or if you prefer the subtle flavor of strawberry shortcake, you can get one of those as a Freak Shake as well). Let me just say, these shakes are not for the weak. It took two of us to attack ours and we still couldn’t finish it. At $14 for the shake I recommend trying them at least once, but get it on an empty stomach and make sure you have a buddy (or two) to share it with. You’ll thank me later. Now, finally, topping Summer Nights off, is the amazing dance troupe, Light Balance. First seen on America’s Got Talent, this dance group is AMAZING. The Abbey Stone Theatre has gone completely dark (when does that ever happen?) to show off the groups neon lights and effects. Without spoiling too much, all I can say is if you haven’t seen these guys perform, you need to ask yourself, WHAT ARE YOU WAITING FOR? If you’ve never heard of the group, take the time and look them up on Youtube. You won’t be disapointed. Their shows are only 12 minutes long, but trust me, it won’t feel like 12 minutes. If you plan to see them this weekend at the park, make sure you get in line EARLY as it’s a show you won’t want to miss and seats fill up fast. Summer Nights ends this weekend, August 12. So, what happens after Summer Nights ends? The precursor to fall, Beir Fest. Beer lovers, this event is for you! Similar to the Food and Wine Festival at the beginning of the summer, Beir Fest is the parks version of Oktoberfest. With over 100 beers on tap each weekend, German foods like pretzels, turkey legs, and bratwurst, live music, and the tapping of the Firkin Keg every Friday, this event is the closest you’ll get to Oktoberfest. Enjoy beers by the glass or by the flight. Pair with a delicious salty pretzel or go authentic with German sausages from Das Fest Haus. Beir Fest run weekends only August 17-September 3.